Summer breezes are blowin’ through the open windows of our farmhouse country kitchen and I’m lovin’ these cooler days. Seems like we’ve either had rainy days or 90 degree days since June, so now that the humidity has left and temperatures have cooled to the upper 70s, I’m a happy camper! One thing I love about summer, my favorite season, is the abundance of wildflowers free for the picking! Each month sees a new variety popping up and I’m always dragging them into the house. My latest round of flower gathering brings a little summer into the kitchen. Can you believe I found this big bunch of yellow wildflowers for free? And no, I didn’t steal them from the neighbor’s yard. One of the advantages of living near the country is that there are plenty of roadside wildflowers. They eventually get mowed down so I try to pick them before the mowers get to them first. 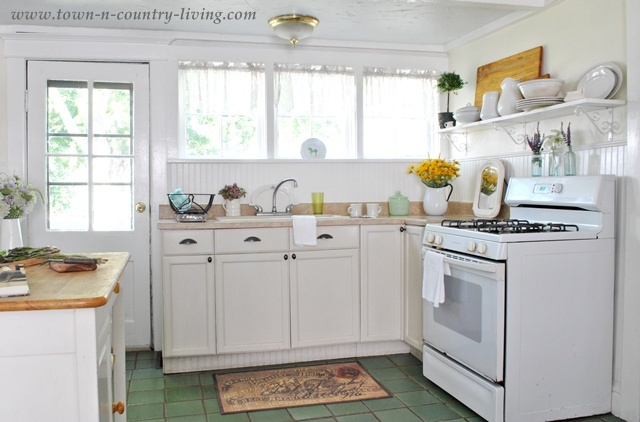 Simple cabinets and open shelving help create a farmhouse country kitchen. No fancy, modern amenities in here. We don’t even have a dishwasher and I’m completely okay with that. Hubby and I enjoy washing dishes by hand. 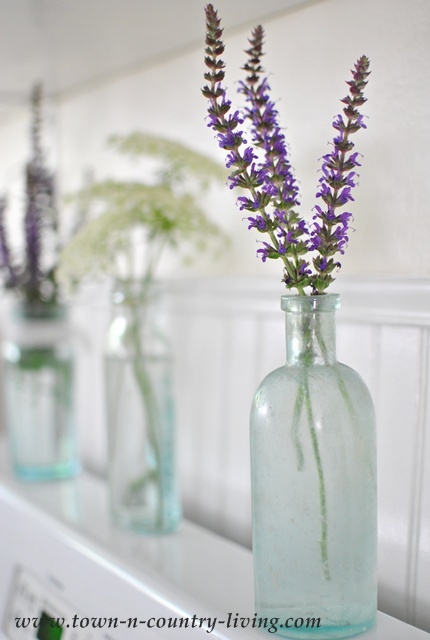 Summer styling in our farmhouse country kitchen includes this trio of aqua-tinted bottles filled with Purple Sage and Queen Anne’s Lace. My favorite bouquets are simple arrangements that only take a minute to put together. Just a few floral touches add summer style to the kitchen and help to brighten my workspace. 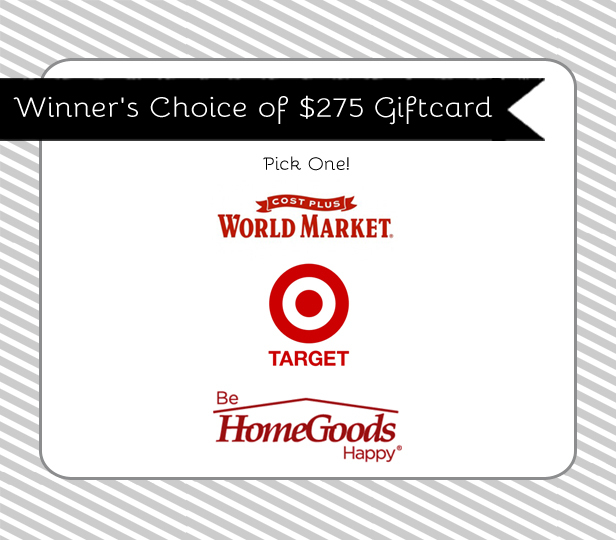 I love cooking and I like a neat, tidy, and pretty area … so I can have fun messing it up! My mother always told me, “Clean up as you go” and as much as I sometimes didn’t want to hear that, she was absolutely right. It makes final clean-up in the kitchen much easier. So I do still try to listen to my mother – she’s a wise woman. My mother did not, however, tell me about getting free wildflowers from the side of the road. This arrangement was fun to create. I filled a small mason jar with wildflowers, placing them haphazardly. Then I tucked the mason jar inside this decorative fixture. The final flower arrangement is a mix of Queen Anne’s Lace, Wild Bee’s Balm, and a few wispy flowers and grasses. Yellow and purple are opposite each other on the color wheel so I like to use this combination to add summer styling to our farmhouse country kitchen. 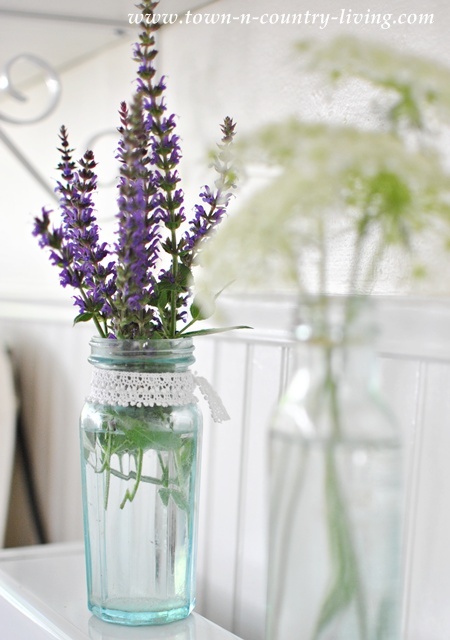 Do you bring wildflowers into your home during the summer? 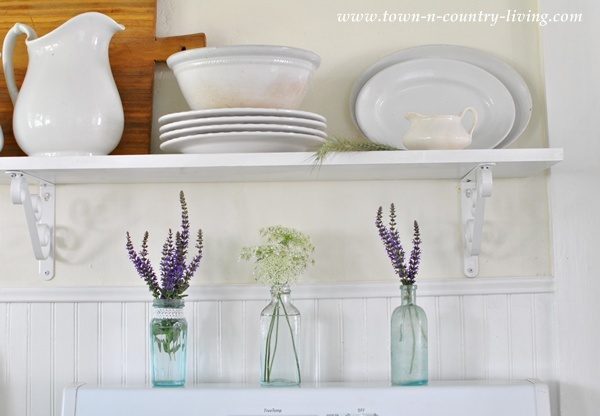 To see more summer styling throughout my home, take the tour of my cottage style farmhouse. Don’t Forget to Enter the $275 Gift Card Giveaway! It really perks up the kitchen with sunshine! I love your open shelf kitchen. I have a dishwasher I never use and wish it was just out of the way. I would like to have all freestanding kitchen furniture because my kitchen is so tiny. 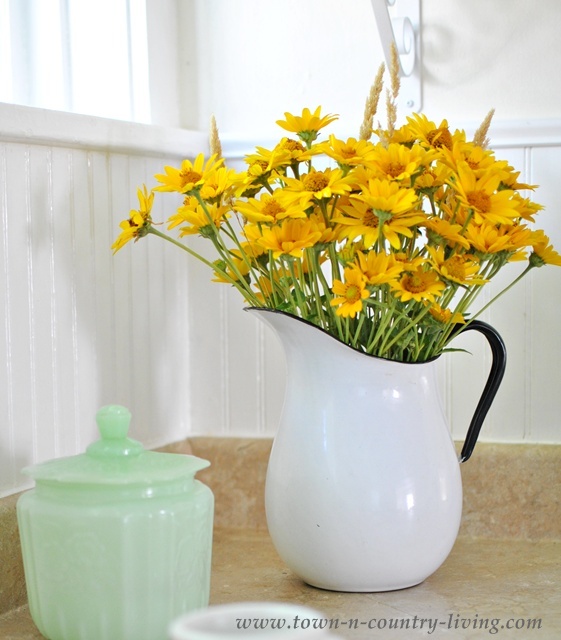 Oh, yes, free wildflowers from the roadside are just the thing to brighten a country kitchen. I love how you put them all around and not just in one area. 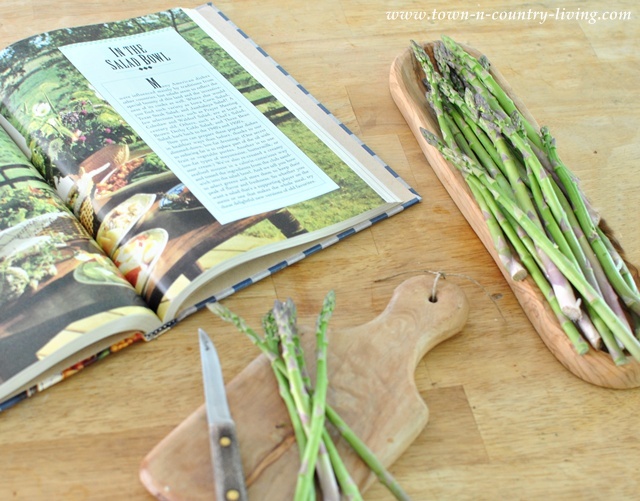 I also love your wooden bowl/cutting board holding the asparagus. Love your wildflower bouquets – so much prettier than store-bought bouquets, IMHO! I passed by some beautiful yellow flowers on the roadside near my house the other day, with plans of going back to pick some. Thanks for the reminder! 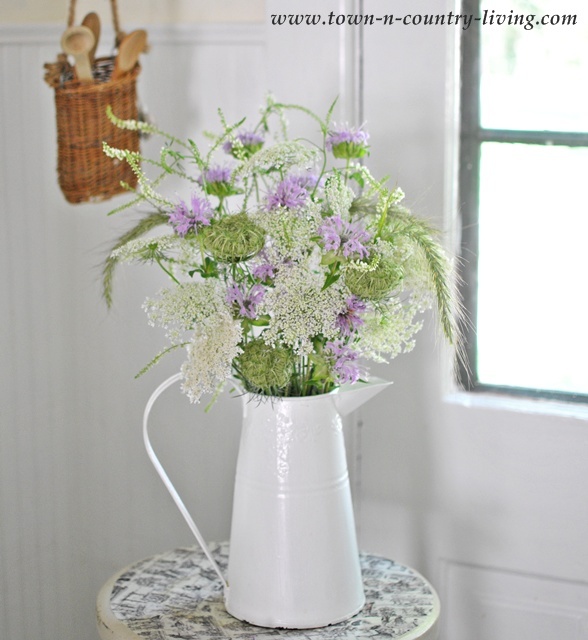 i LOVE the queen anne’s lace and bee balm pitcher! so pretty! Everything looks so sweet and summery!! Love the way you’ve added the wildflowers around to make such a cheery place to work. Love your wild flowers….they’re so pretty. I keep saying I need to leave clippers in my car to pick some of Indiana’s great road side gifts but now I think I’ll just get up after I submit this comment and just go buy a pair! Very inspiring, thanks for sharing it. Loving all the summer beauty in your fabulous kitchen!! What beautiful flowers! In my travels I always admire the roadside wildflowers but never seem to manage to actually pick them and enjoy them in my home. You have inspired me. I’m on my way out the door with my clippers. Thank you. 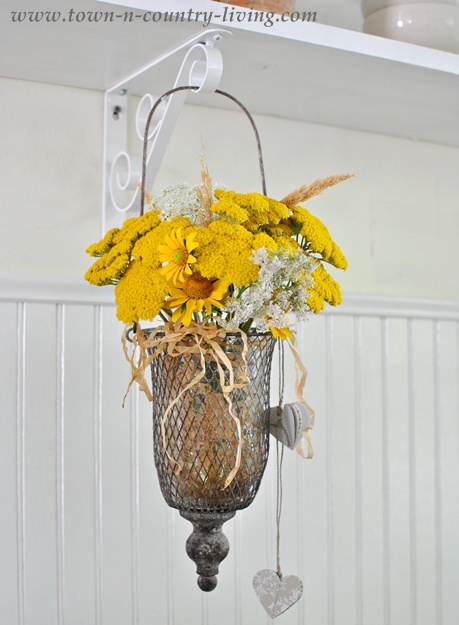 Yep, I keep the clippers and a water jug in my car 🙂 I love your little hanging fixture with the flowers-so cute! Can’t buy flowers any prettier than the ones you picked. I don’t use my dishwasher much. At Christmas when all the family is over, my sister and I wash them by hand and have good conversation doing it. I love your home, very nice. 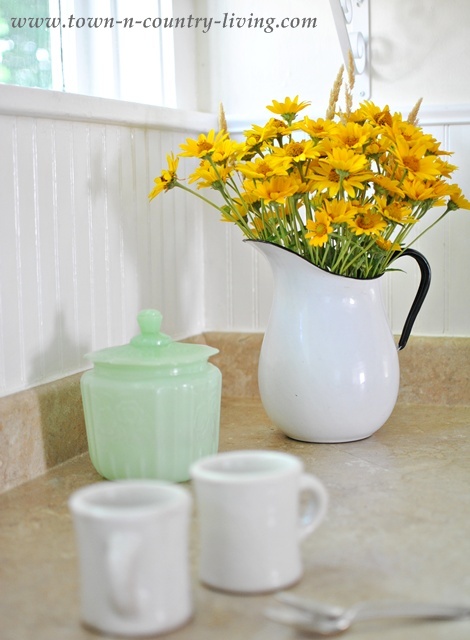 You can’t go wrong with fresh flowers in the house Jennifer and I love the pop of colour form the yellow daisies. Very fresh and perfectly farmhouse. It’s lovely to be back visiting my old friends again. I’ve definitely missed blogging recently. 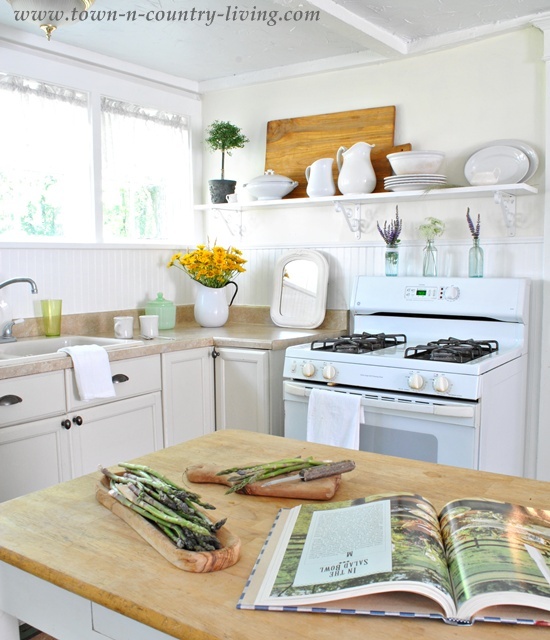 Your kitchen is so beautiful – so bright and airy and happy – and I love all the touches of fresh flowers! Queen Anne’s Lace is one of my favorites, and I hope to finally remember to find some seeds to plant it next year! 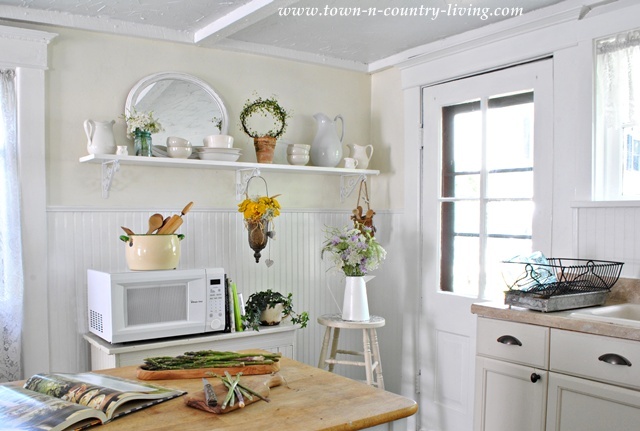 I have always loved your kitchen, and it just gets better with each visit:-) Love the flowers and the welcoming feel! !